For this coffee, you do not need any additional ingredients. It is the absolute coffee in Italy, where it is simply called “Caffè”. For preparation, you need around 7 g of ground coffee per cup from medium-roasted to strong-roasted beans. With high pressure, 50 ml of hot water is pressed through the ground coffee. The result: red-brown to dark brown coffee with a fine, golden brown crema. Espresso, with enough milk foam on top of it to fill the cup. Sprinkle come cocoa powder on top. 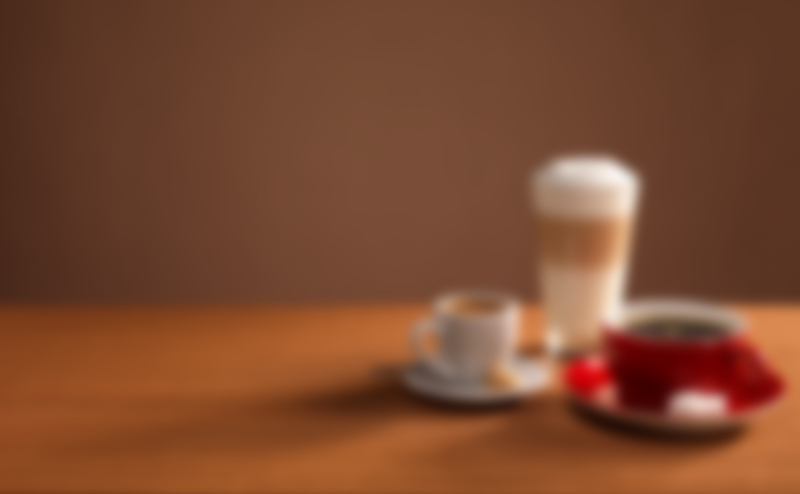 The typical coffee of the Swiss; it is also called "Schümli-Kaffee". 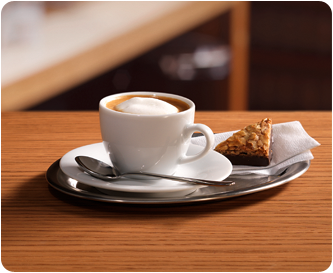 Prepared according to the espresso principle, but with 120 ml of water and with Café Crème beans. Due to the lower degree of roast, they taste milder than espresso beans. For preparation, you need around 7 g of ground coffee per cup from medium-roasted to strong-roasted beans. With high pressure, only 30 ml of hot water is pressed through the ground coffee for the Ristretto (espresso 50 ml). Its French counterpart is called "Café serré". Espresso or Caffè Lungo, which is infused with approx. 80 ml of foamed milk. The Viennese version, the Kapuziner, receives a dollop of cream on top, as the crowning touch. Grated chocolate can also be sprinkled on top, if desired. 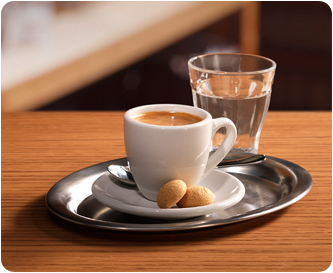 Espresso, which is prepared with the double quantity of water. 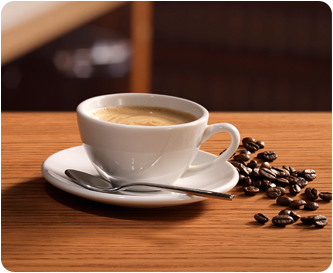 For preparation, you need around 7 g of ground coffee per cup from medium-roasted to strong-roasted beans. 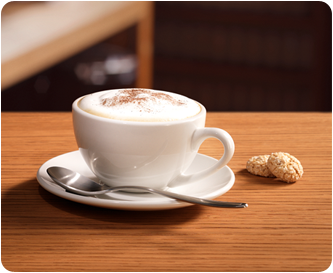 With high pressure, only 100ml – instead of 50 ml, as with espresso – of hot water is pressed through the ground coffee. That is also why it is called a “Verlängerter” [“Extended one”] in Austria. Classically, it is a mixture of 100 ml of frothed milk and 100 ml of Café Crème. In Austria, it is called a Melange. With milky coffees from Italy and France, the proportion of milk is higher: For Caffè Latte or Café au lait, Café Crème is infused, as required, with ratio of 1:2, with hot milk/frothed milk. Both are best served in large ceramic cups. 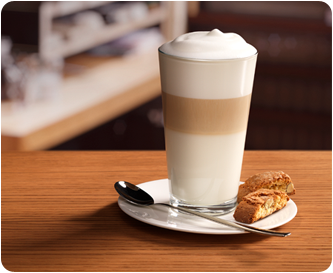 Careful layering work is required for this: froth up 120 ml of milk in a latte-macchiato glass. 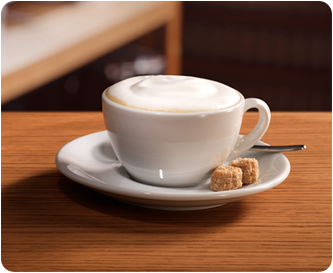 Slowly and carefully pour in a double espresso – is should settle as a visible layer between the milk and foam.